An educational farm to train the next generation of farmers on sustainable growing practices. Uses existing infrastructure for distribution to college campuses. Read on to learn more about the people who make this happen. What is your role in the Market Garden? Eva: My role as an AmeriCorps VISTA in Vermont Tech’s Market Garden is to work with Molly to manage the handful of wonderful market garden staff and volunteers to produce and distribute organically grown produce and provide the crew with educational opportunities. We discuss the projects that need attention each week and the crew and I work to get it done. It’s a good combination of learning how to grow produce, sharing that knowledge with others, and learning how to manage people. Molly’s farming experience and knowledge are absolutely critical to the vegetable production and we all look forward to her educational lessons. Being a College-run garden, learning is central to so much of what we all do here. Molly: My main role is to oversee and guide the manager (this year being Eva) to produce high quality produce for the VSC and other institutions. I also develop vegetable farming related curriculum for courses that can potentially utilize the fields for hands on educational opportunities. Eva: For just over a year, I lived and milked on a small organic dairy farm in Waterbury Center where I fell in love with Vermont and its working landscape. From there, I took half a year to travel in Asia. During part of this time, I volunteered at an elephant sanctuary, living and working outdoors with minimal utilities. My experience there inspired me to reassess what I wanted in my life, and one of the top priorities is physically working outside. The food piece came about from the (at least) thrice-daily necessity of needing to find quality and affordable food to eat. I’d initially joked that I was just going to eat my way across the continent, but this is pretty much what happened. The combination of a love of good food and being outdoors seemed to naturally point to farming, so I applied for my current position and headed off to WWOOF in Japan to get a better taste for it. I’ve tried to immerse myself in as many food-related activities as possible, including volunteering with the Randolph Area Food Shelf and the Vermont Foodbank’s VT Fresh program, and my overall experience has solidified my desire to continue to be a part of Vermont’s vibrant food systems and agriculture world. Eva: There are so many things I love about my job. I am grateful for being able to feel the weather so acutely, especially the welcome breezes and the flawless days. I’m stoked that the Garden is able to supply not only our partnering campus cafeterias with fresh produce, but our community as well. Last year we donated produce to the Randolph Area Food Shelf, and I’m happy to report that this year we’re expanding distribution to the Bethel Food Shelf as well. It’s great to know that we’re able to contribute to food security efforts and that we’re providing healthy and delicious food options for people who may not have access to it otherwise. Another really exciting part of my job is that this year I was responsible for grafting the tomatoes. Though it was a stressful process initially since I didn’t know if they were going to take, I now feel like a proud parent every time I step into the tomato house and see it filled with strong plants climbing their way toward the ceiling on their trellis lines. In fact, I just ate my first perfectly ripe Sungold today! Molly: I studied botany as an undergrad and knew I wanted to work with plants. I have strong agricultural ties to VT on both sides of my family so there has always been a draw to agriculture as well. I have worked and managed dairy, maple and horse farms. When I started vegetable farming I knew this is what I wanted to do. Every day is different, each growing season bring new challenges and there is never a dull moment. I have never said I’m bored or sick of sitting in front of this computer as a vegetable farmer. To me it’s a way to make a living, follow my passion and provide a quality of life that fits for me. What are you excited about when thinking about the future of the Market Garden? Produce ready for delivery to St. Michael’s College, Norwich University, Champlain College, and Vermont Technical College. Eva: We’re not exactly sure what the Market Garden’s future looks like, but we’re fine-tuning it as we go. For instance, this year we had thought of focusing on greens, but after the first succession of salad mix germinated we decided it’s not feasible because of the weed pressure in our fields. However, other crops, such as head lettuce, do really well there and we have a strong market for them so they’re definitely a keeper. This learn-as-we-go method over the last few years is continually shaping the Garden, and I enjoy taking lessons from daily, weekly, and monthly experiences with tasks and projects and thinking about how to do them differently or more efficiently in the future. Continual improvement and education is at the core of the Garden, that much is certain. Molly: I get excited about the idea of growing food that reaches large institutions that feed many people. Providing fresh, local, healthy food to folks that eat at institutional cafeterias makes me feel like we are making a difference. I love that the market garden is created in a way to provide educational opportunities to those interested in vegetable production. 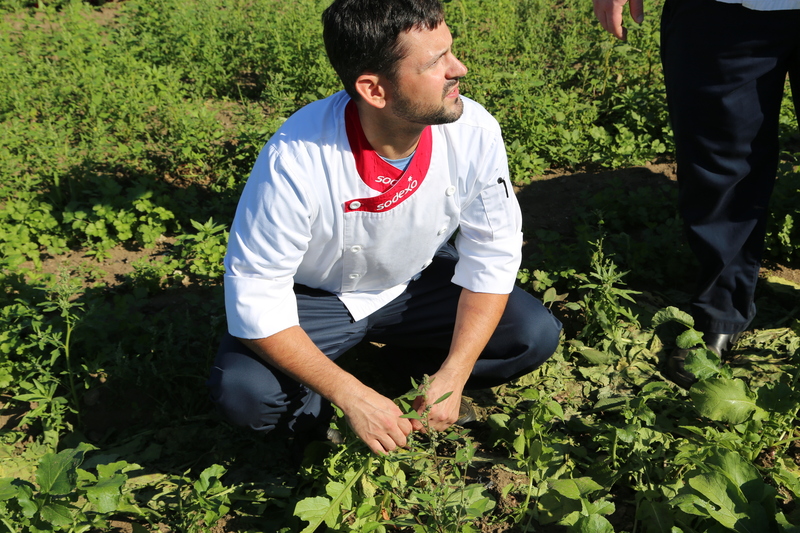 With Sodexo as a partner, VTC’s access to equipment and professional savvy in all aspects of agriculture we give students a real farming experience. Students can leave knowing how to work the fields, the importance of securing a market and figuring the finances for that given market. Above all, I love watching future generations learn skill around agriculture and food production. While I am and will remain the cheerleader for all things Vermont, I would be remiss to not mention some of the great work happening in our fellow New England state – Maine. For a quick comparative study of Maine and Vermont agriculture, look here. Pay particular attention to the dark blue – vegetables, melons, potatoes, and sweet potatoes. As much emphasis we place on vegetable production in Vermont, Maine’s current production capacity is considerably larger than what we can produce here in Vermont. I find that this chart really demonstrates that difference – I often forget how much of a difference it is. 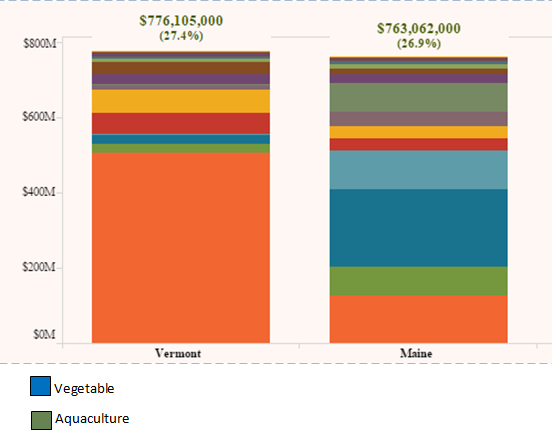 Moving beyond produce, the heart of the exciting developments in Maine i s centered around seafood – sustainable seafood (please note the dark green aquaculture in the above comparative chart). In partnership with the Gulf of Maine Research Institute, Sodexo has been deeply involved in creating a market for under-utilized fish species, like dogfish, redfish, and hake. Sodexo is engaged in the research to create the market for fisheries to supply these multiple fish species – which previously have seldom appeared on any type of menu – to local consumers on campuses. See for yourself. This highly-acclaimed partnership and the resulting market development work have come to be cornerstones of Maine’s equivalent of Vermont First – the Maine Course. There is certainly a lot that Vermont First can borrow from Maine Course, and we like being in good company as we work on ambitious, market-changing initiatives. A pat on the back to our friends in Maine, and a huge thanks for the delicious lobster dinner last night in Biddeford (pronounced Bid-ehh-fehd) at the University of New England! Strolling Across Markets: Can Vermont Lead the Way, from Direct to Wholesale? Strolling of the Heifers is a Vermont non-profit known for its Localvore Index that ranks US states for the general availability of local food in each state. For the past two years, Vermont has reigned at the top of this list. The ranking is based on the ubiquity, per capita, of direct markets – like CSAs, farmer’s markets, farmstands, any type of market that emphasizes the direct relationship between the farm and the customer – that point to the proliferation of farm and food activity within a state’s borders. While direct markets per capita have certainly provided a good measure of the emergence of local food accessibility in the last decade, there are now questions if this method continues to measure the depth of the local food market. This article, from April 2015 considers how the inclusion of wholesale markets might alter theLocalvore Index. An interesting read, and important for us to consider how Vermont would rank if measured across markets, from direct to wholesale. Would Vermont still top the list? If not, what can we do to get back on top? Earlier this week, I came across an article called Is it Time to Table Farm-to-Table? by Corby Kummer, published in Vanity Fair. This article captures part of an unfortunate trend that questions the integrity of the local food movement. Kummer went so far as to say that no one cares about where their food is from anymore: “That’s where the future of farm-to-table should be: food that speaks for itself without having to tell you where it comes from.” I read the article, starting writing about it, but couldn’t get beyond saying that it was just plain wrong. I didn’t realize it then, but I was reading the article at the right time. I was heading into a week of learning from people who would have some thoughts on this topic – and fairly opinionated thoughts at that. On Wednesday at a local food campaign meeting put on by the Vermont Farm to Plate network, Megan Sheridan of the Vermont Fresh Network, measured up “that Vanity Fair article” as a case of the counter-local food movement missing the mark. Yesterday, at the New England Food Summit in Boston, I was catching up with Scott Sawyer of the Vermont Sustainable Jobs Fund. I couldn’t help but seek out his opinion on the article, and in the way I was secretly hoping he would, he brought it full circle. Kummer offers a shallow review of what could be best categorized as a first world problem – tiring of too much of a good thing. In Vermont, it has been just over five years since the launch of Vermont Farm to Plate, our state’s strategic plan. We have made it through the first sprint, but now is the critical time to test our endurance and commitment to not be a trend but a fundamental shift. Scott encouraged me to move my focus from Kummer to focus instead on some of the larger indicators of the real impact of our work in building a resilient food system. He referenced evidence of large companies who are adapting to target a customer who is demanding fresh, sustainable, and local products. The purpose of our work in Vermont First is to keep the integrity in the words we use to describe our local and sustainable purchasing, building trust with and between our partners in the food system. We are part of the growing indicator that the local food movement is not just a short-lived trend. What have we been thinking about these past three months, you ask? Vermont First is Sodexo’s way of saying that buying local is more than a trend, more than a serendipitous, one-time purchase, more than a photo-op. Buying local is a way of doing business that requires strategy, committed partners, and the alignment of values that resonate with all of us: building strong communities, the availability of healthy food, supporting a sustainable, local economy, and protecting the environment. Vermont First will create the road map to integrate these values into the Sodexo business model, which is a model that operates across 80 countries and supports 400,000 employees. The more we think about this, there is one thing we know: we cannot do this alone. 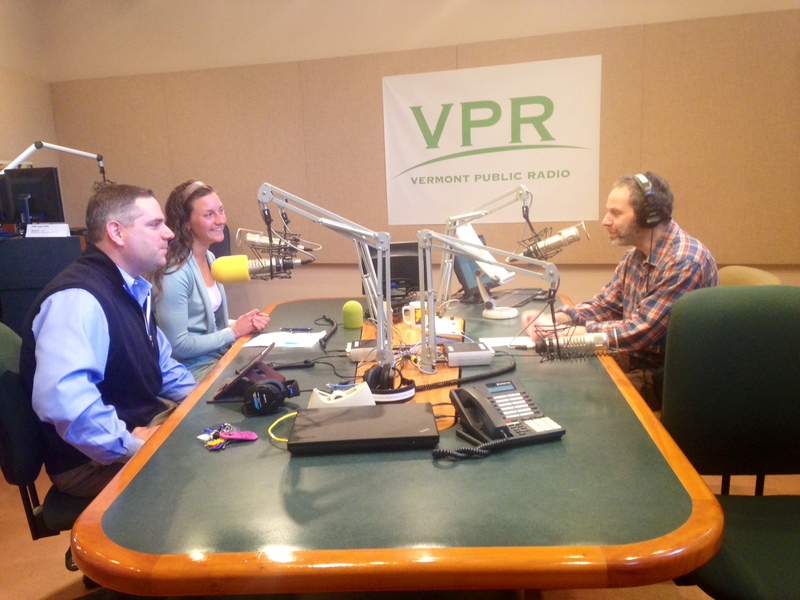 Annie Rowell (me) and Phil Harty, our Regional VP, talking with Mitch Wortlieb on VPR’s Morning Edition. We need to be sure we always know what Vermont thinks. In order to help accomplish this, we will be assembling an Advisory Board this summer made up of individuals who represent the diverse sectors of the Vermont food system, from people who teach about food, to people who grow food, to people who move food to where it needs to go. What does New England think? Vermont First has – you guessed it – a statewide focus. Our regional partners think that while state borders are important, we must balance our state perspective with a regional perspective. 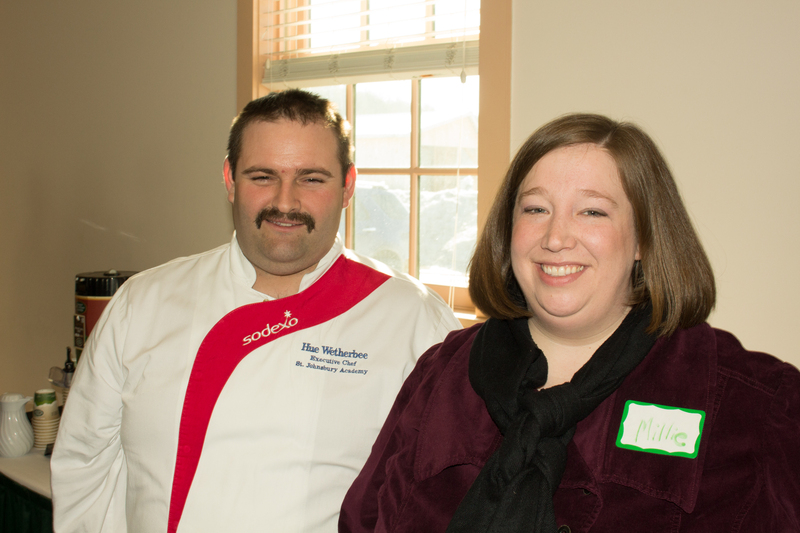 Chefs from UVM visit Catamount Farm. What do Sodexo managers and chefs think? This is group of people who know an opportunity when they see one and know how to make things happen. Managers and chefs want more information. They want to be better networked with the farms and food businesses around them. They want to know when and where there is a viable local product available that they should consider. They want to be able to tell the faculty, staff, and students on their campuses where the food they are eating is coming from. What do farms and food businesses think? To farms and food businesses in Vermont, Vermont First means a market opportunity for their products. Sodexo is a very different market from other markets in Vermont. 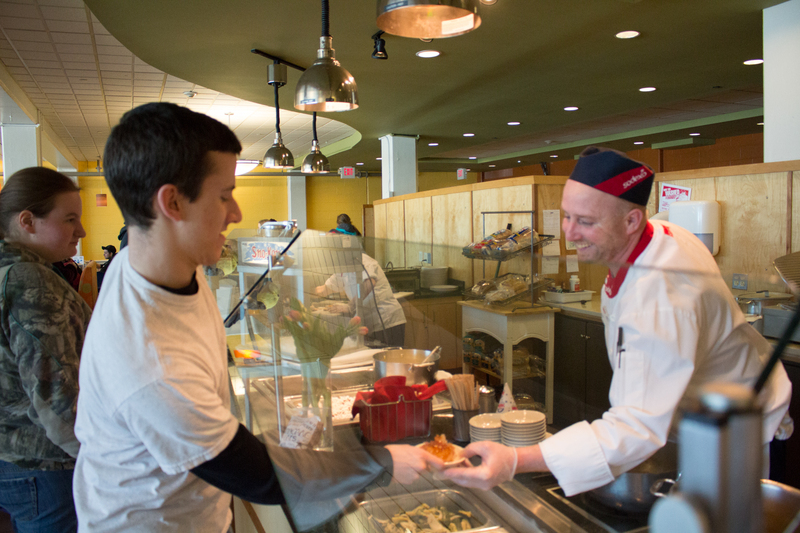 Vermont entrepreneurs want to know what Sodexo is looking for and how to do business with us. What do our vendors think? Our vendors work hard to bring us the local products that we want. Often times, local sourcing is part of their mission as well and they are happy to see the market growing. Vendors are on board to help us track our progress by providing us with purchasing reports that tell the story of our shared success as we work towards a common goal. Organizing summer farm tours to help build stronger connections between farms/food businesses and campuses. Meeting with and surveying our contracted vendors on an individual basis to improve our systems for communicating to them what we need, from products to reporting on our purchases. Vermont First is Sodexo’s response to the demand for more local food. In 2014, we purchased 15% local food. Increasing this number will take commitment and patience from all our friends and partners in the food system, both in Vermont and beyond. Now, on to the next three months! Bonnie Kelsey and Jennifer Wood of Best of Vermont visiting with Abbey Willard of the Vermont Agency of Agriculture, Food and Markets. In early March, we happily announced that we have successfully hired a local food coordinator, Annie Rowell, who is tasked with moving the remaining commitments in the Vermont First Pledge forward. Learn more about Annie and Vermont First from our interview on Vermont Public Radio’s Morning Edition with Mitch Wortlieb on March 23rd. As we think about goals for the future, we look back to all that has been done this past year. In 2014, Sodexo purchased $3.2 million of local products across Vermont accounts, just under 15% of the total Vermont account purchases. Now we look to that 85% of non-local dollars spent and think critically about how we can convert those dollars to local in a way that is both responsible to all parties and creates lasting relationships. 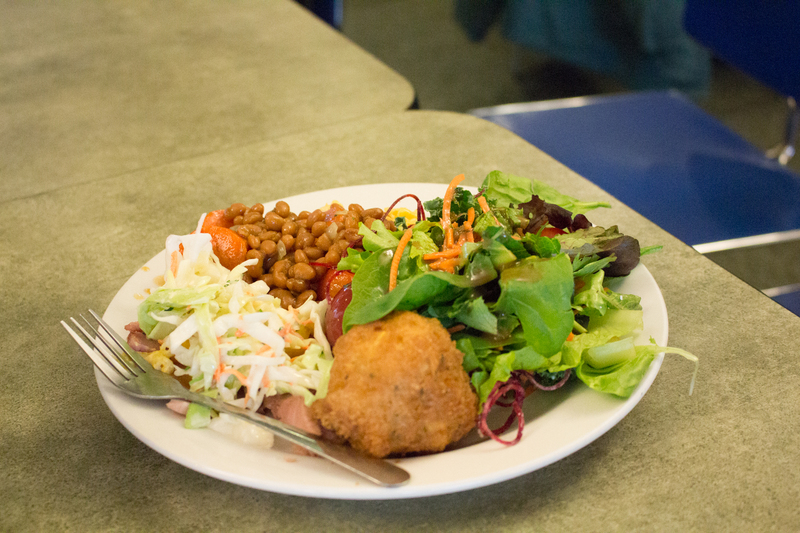 Delicious local lunch provided by Vermont Technical College dining team after the morning meeting. Vermont Technical College students lining up for sugar on snow, using Vermont maple syrup.